From Bordeaux, Tuscany and Sonoma County, California to Margaret River vineyards in Australia, Cabernet Sauvignon is world’s most acknowledged red grape variety. In fact, it is called the king of all red wine grape varieties. And no wonder why. The vast aromas and flavours is something you can experience only with Cabernet. The Cabernet Sauvignon grape was an accidental breeding. The DNA testing done about 15 years ago proved that Cabernet is a cross between a red Cabernet Franc grape and a white Sauvignon Blanc grape. The accidental breeding occurred in the seventeenth century in southwester France. Isn’t it amazing how this mistake turned out to be ‘the king’ of all red wines! The winemakers in Bordeaux were very pleased with the grape’s vigorous levels of tannins, which meant the wine could develop in the bottle for longer period. They also concluded that it responded amazingly well to oak, and that this type of aging boosted and implemented beautiful new flavours. The result was a full-bodied wine with a medium level of acidity that was easy to drink and paired heavenly with different foods. Soon, the winemakers started experimenting and began blending the Cabernet Sauvignon grape with other varietals, such as Merlot. The result was one of the most famous wine blends created: the Bordeaux blend. The Bordeaux wine blend swept the world pretty fast and so did the Cabernet Sauvignon grape. 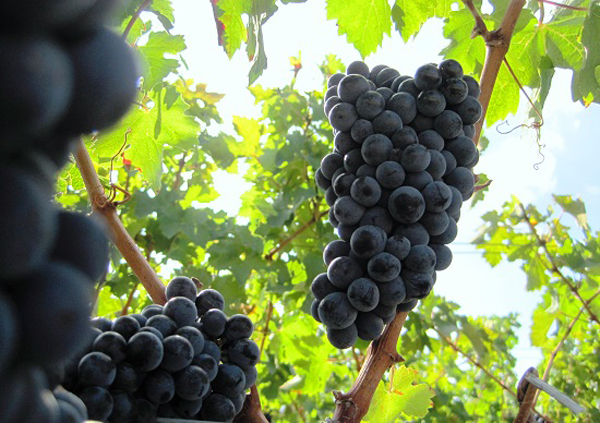 As the name of the grape became more and more popular, winemakers all over the world started growing it. Today, Cabernet Sauvignon grape varietal grown in all top wine-producing regions across the globe and is known for its durable, thick skin and is relatively easy to grow. Many call Cabernet Sauvignon, the great colonizer. As a wine, Cabernet Sauvignon is appreciated for its full body, dark colour and high alcohol content, which can be over 13.5%. Most Cabernet Sauvignons are produced in Australia, California and Chile and are dry and feature a great level of tannin (the ‘dry mouth’ feeling). In terms of flavour, almost all Cabernets feature the flavours of green pepper mixed with cassis, tobacco, cherries and a hint of vanilla derived from the oak during the aging process. Thanks to its tannins, acidity and alcohol, Cabernet Sauvignon is a wine that pairs amazingly well with different foods. And because we don’t believe there is a rule to be followed when it comes to wine and food pairing, feel free to drink the wine with any food you like to eat. But one thing is for sure: never drink Cabernet Sauvignon by itself; this is a wine to drink with food (braised lamb or pork, burger, pizza or a mushroom dish).